March 31, 2017, 7:12 p.m. It goes from flat to punchy and back to flattish. It's way harder than MTN highway but not as hard as say GSM and PL, but it's longer. The climb after the top of upper tall cans is a bit of a puker but then it goes flat again. It's nice to have a sweet climb option on Cypress! April 2, 2017, 5:27 p.m. It's much harder than Old Buck. More like No Quarter in terms of difficulty. I usually go up Eagle Lake Rd then past the transformer station. You can take it all the way to the upper works yard so you can connect with SGS or Meat Sweats. Or all the way to the ski hill. Once you get to Slippery Canoe you're past the worst of it. It's definitely hard but nowhere near as tedious as the road. April 2, 2017, 7:12 p.m.
Great stuff. Need to start exploring more on Cyps. May 20, 2017, 11:15 p.m. Anyone been up higher than Bkind Skier/SGS? June 26, 2017, 10:01 a.m.
Road work is starting on BLT and will run until the middle of July. Expect heavy equipment moving about the road, making it unsafe for riding. 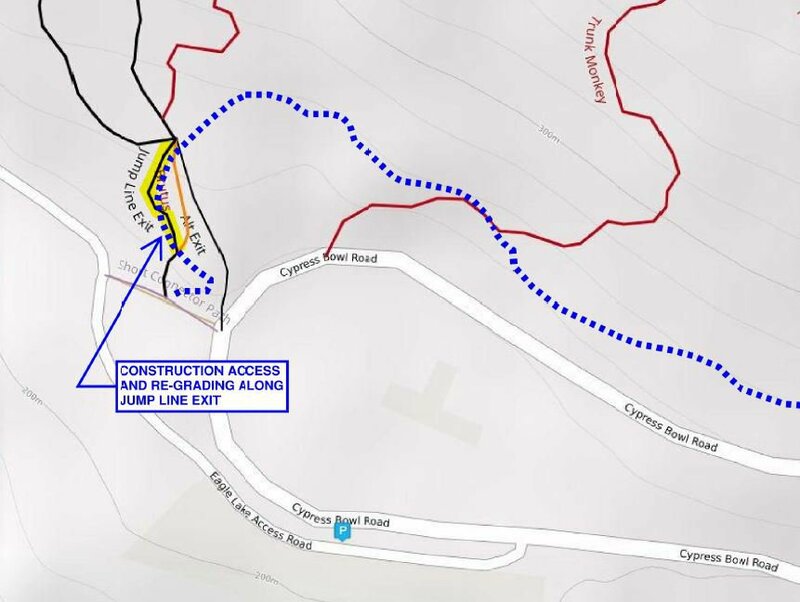 They're regrading steeper sections between Single Lane Traffic and Fern Trail. That means moving a lot of dirt, so the road will be a mess. I'm told they'll try to make it generally rideable at the end of each day. Watch for equipment parked on the road. Personally, I won't ride my cross bike up BLT until the work is finished. June 28, 2017, 12:16 p.m.
Hey Alan, do you know what time the work crews wrap up for the day? June 29, 2017, 10:05 p.m. They usually wrap things up by 3:30, but I wasn't told that until 5:30. Hope your ride went well. July 7, 2017, 12:11 p.m.
Not a trail question, but does Chippendale Road go through to Cypress Bowl Road, or is it just for construction traffic these days? Last edited by: PaulB on July 7, 2017, 12:13 p.m., edited 2 times in total. July 7, 2017, 4:30 p.m.
Aug. 3, 2017, 2:04 p.m. If you're hitting Cypress between 11 AM and 2 pm on Sunday, Aug 6 bring your small change and taste buds. Innocent Ice Cream and Tacofino will be there as part of BPP's Paint on the Mountain Plein Air in connection with the Harmony Arts Festival's Grand Prix Plein Air Challenge. In addition to food trucks, live music and bocce ball, this is a good chance to enjoy the view from the flat area south of the 1st switchback on Cypress Bowl Road. Ask where the pub will be located. Ask about secure bike storage so you can enjoy the pub! All proceeds go to Hollyburn Family Services Society. Last edited by: AlanB on Aug. 3, 2017, 6:14 p.m., edited 2 times in total. Aug. 5, 2017, 9:38 p.m. Okay. Maybe forget the view and go for the toonie tacos and ice cream. Nov. 30, 2017, 10:03 p.m.
Last edited by: AlanB on Nov. 30, 2017, 10:04 p.m., edited 1 time in total. Dec. 1, 2017, 7:52 a.m. The beginning of the end for the west side of cypress! Dec. 4, 2017, 11:18 a.m.
Change is coming. That's been known for a long time. What we don't know is what that change will look like. Mtn biking will be a part of the future of Cypress Village, but what that future will include is still shrouded in mystery. Dec. 18, 2017, 10:43 a.m.
How's the snow line on Cypress these days? With time off work and high pressure returning Wednesday for a while, I'm thinking of getting the DH bike out for some shuttling while waiting for better snow to ski. Still have never ridden Cypress, from POV videos it looks like Meat Sweats and Jersey Shore are good/fast trails for DH bikes? Not looking for insane gnar, more speed and jumping. Last edited by: grambo on Dec. 18, 2017, 10:44 a.m., edited 1 time in total.